Subject wise, Class wise Learning Outcomes Posters, Hand books, Posters and Hand books on Learning Outcomes for Classes I to X/Posters, Teacher Handbooks on Academic Standards/ Teacher Handbooks, Posters on Subject wise Class wise Minimum levels of learning(MLLs). Telugu, English, Hindi, Maths, EVS, Social Studies, Physical Science, Biological Science Learning Outcomes. The booklet details how students with hearing, cognitive, visual and other impairments may take more time or require attention to learn. The Online Learning Outcomes Booklet released on the department’s website gives a class-wise and subject-wise classification of the pedagogical processes and learning outcomes. The SCERT (Telangana State Education Research and Training) released a document titled ‘Learning Outcomes’ which will help the parents of students studying between Class I to VIII in Schools judge if the school has enabled the child with correct/enough knowledge for a student of his age. The Learning Outcomes online booklet released on the department’s website is a resource for both teachers and parents as not only does it enlist the learning outcome but even gives a detailed explanation of the pedagogy processes to be followed by teachers to arrive at these learning outcomes. 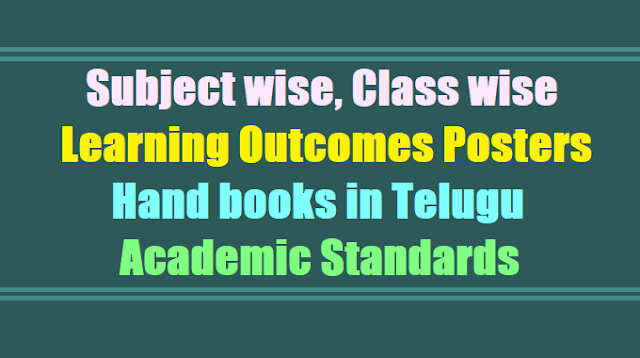 The Learning Outcomes document, which is both in English and Telugu gives a class-wise and subject-wise classification of the pedagogical processes and learning outcomes. For example, in the English booklet, in Class I English syllabus, it is suggested in pedagogical process to be followed by teachers that the learner (students) should be provided opportunities in pairs, groups or individually and encouraged to name common objects such as man, dog etc. when pictures are shown. In the learning outcomes, which can come in handy for parents, it is said that the student should be able to associates words with pictures and name familiar objects seen in the picture. The four main subjects covered are Telugug, English, Mathematics, EVS and Social Sciences, where from Class I to VIII, entire pages are dedicated to different pedagogical approaches and their desired learning outcomes. The Learning Outcomes booklets have special sections dedicated to children with special needs where it is clearly mentioned that such children may need more time and individualised attention. The Learning Outcomes booklet details how students with hearing, cognitive, visual and other impairments may take more time or require attention to learn. Since the introduction of the Right to Education Act, no school can fail a student up to Class VIII. While this policy is under review owing to several debates over it, many put the onus on teachers. The government has been implementing various initiatives since the introduction of the RTE act to gauge the learning outcomes of students for which even the baseline tests are conducted to gauge if students have the basic knowledge of the subjects required for their age. However, this Learning Outcomes document, which was prepared by the NCERT and later adapted for the state by an expert committee, will come in handy for parents. They can now judge for themselves if the students are up to the learning level for their age and even teachers can do the same. If not, then interventions are expected to be planned to help the child cope up. Parents too welcomed the idea. Parent of a Class VI student of a SSC board school in Camp, said, “I will definitely go on this website and check what is listed there. I take tuitions for my son and am constantly checking his academic scores which gives me an indication of how he is doing. But if there is any such document, then it would be worthwhile to visit and just check for ourselves if our children are matching up or not". Such initiatives would work only if all parents or teachers showed interest. “Most parents are not even bothered about the academic performance of their children. They just put their children in schools and forget them. As far as teachers go, they are already so overburdened and there is so much available on pedagogy. Only time will tell if this would be of any use”. C and DSE Telangana - Rc.No.43, Dated:14.09.2017 :: Sub:- RMSA, Telangana - School Education Department - Conduct of training to the DRPs on learning outcomes from 14.09.2017 to 16.09.2017 in all the districts+ Certain further instructions - Orders Issued. Ref:- Procs. of the Commissioner & Director Of School Education & Ex-Officio Project Director, Rmsa, Telangana, Hyderabad, dt.07.09.2017. All the DEOs in the State are hereby informed that vide reference cited, detailed instructions have been issued for the conduct of one day training on learning outcomes to the Teachers of Primary, Upper Primary and Highs Schools at school complex level before 18.09.2017. for this, training to the DRPs at district level is being conducted during 14.09.2017 to 16.09.2017 by State level resource teams. In this regard the posters on learning outcomes i.e., subject wise and class wise have been e-mailed to all the DEOs (A4 Size). The DEOs are directed to make photocopy of the posters and give to the subject DRPs attending training at district level, so that they can make use the same copy during the training at school complex level as RP. Rs.30/- per person (DRP) is permitted towards photocopy, one note book, training stationary etc. The expenditure towards this and also training may met from the training budget of SSA available with DEOs and DIET Principals. Learning Outcomes Telugu English Hindi Maths EVS Phy. Science Bio. Vide reference cited, instructions have already been issued that the handbook on learning outcomes for both Primary and High schools have been printed and supplied to DEOs during Aug, 2017 and copies must reach to all schools and the teachers must attend training at school complex level on learning outcomes with handbooks pertaining to learning outcomes. All the DEOs are directed to take immediate action in this regard and conduct the training both for DRPs and as well as for teachers effectively and review the status of attendance with Sector! officers, Nodal Officers and MEOs. In view of the instructions of the Commissioner and Director of School Education and Ex-Officio Project Director, RMSA/Model Schools, Telangana State, Hyderabad, it is proposed to conduct one day Orientation Programme to all the teachers of Primary, Upper primary and High Schools on Subject wise ,Class wise at School Complex level on implementation of Learning out comes and prepare children for undertaking National Achievement Survey (NAS).The Orientation programme to all the teachers on Learning outcomes shall enable them to prepare for National Achievement Survey scheduled to be conducted in the month of November 2017.